We specialize in Department store Customer returns, Display Models, Discontinued items,Store Stock Items. We offer Items like Kitchenware, and table ware, Toys,Bedding, Towels, Clothing, Shoes, accessories, tools, exercise equipment, furniture and much more.Many items we list are brand new, some are like new and some may have minor Damages, Flaws, Scratches, Dents. etc. We do our best to list all items accurately. New Open Box - New Item, unused and in perfect condition with no damage. However item's box is open, Not used at all. Cosmetic condition is MINT. Like New - USED ITEM. Undamaged, almost no sign of use (no scratches or smudges), item is or could easily be mistaken for brand new. Cosmetic condition is near MINT. Very Good - USED ITEM. Doesn't look brand new but has no easily noticeable damage to the item, very minimal identifying marks o item, very minimal wear (can be a presentable gift for a friend). Cosmetic condition is Very Good. Good - USED ITEM. Slight wear to the item (some scuff marks or smudges). Cosmetic condition is good with some wear. Fair - USED ITEM. Cosmetic damage, wear, and smudges to the item (item has been beaten up a bit, might need cleaning) but still intact and in working condition. Cosmetic condition is OK with signs of use. AS-IS - items that are listed with the following "As-Is" words in the description area are NOT returnable and are NOT eligible under the "guaranteed against DOA" or "100% money back guarantee" policy. No exceptions. All of the conditions listed above (except As Is) will also represent that the item is in perfect working order unless stated otherwise in the Description section (for ex. as is items) Every single item you see here is inspected (this includes New open box items as its the only way to guarantee any item prior to posting and shipping) and in most case tested (if the item can be tested). This means that you are guaranteed to receive an As stated item. What you see in the pictures is what you will receive. If it is not pictured, it will not come with the item (unless otherwise stated in the description). We take a great pride in what we do, and we are fully committed to insure every item is inspected, description is well written, and great pictures are provided. Our strong commitment to customer satisfaction.We strive to build a pleasurable buying atmosphere and exciting environment for our buyers. We will keep working hard to insure that you get the possibly BEST products, for the BEST price! We offer great products, low prices, fast shipping and a professional friendly service. If you are happy with your transaction we invite you to leave positive feedback, we will leave you a great positive feedback right away after your purchase. If you feel the transaction did not meet your expectations please contact us before leaving negative feedback so we may try and resolve your issue. LOCAL PICK-UPS ARE SCHEDULED by calling us or emailing us. Cash is the only acceptable method of payment upon PICK UP. We Will like to Thank you for visiting our Booth! 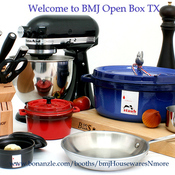 bmjhousewaresNmore doesn't have any items in their booth!